You are here: Home / Office Desks / Is The Walker Edison Soreno 3-Piece Corner Desk Worth It? Does this desk actually stand the test of time? My Walker Edison Soreno 3-Piece Corner Desk review will answer all questions and concerns you may have regarding this desk. 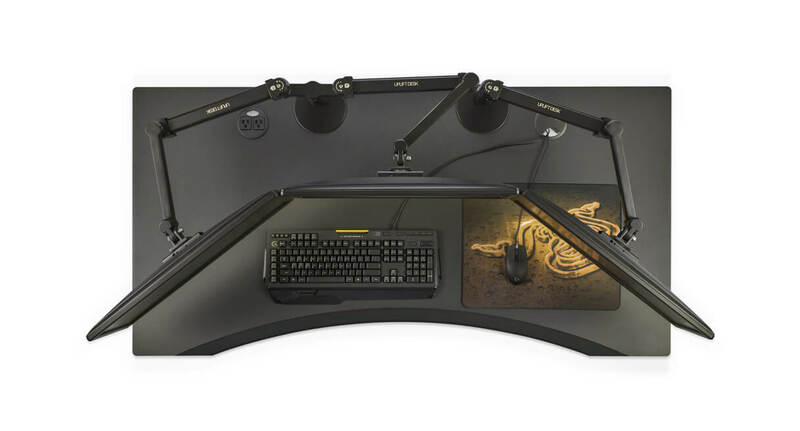 I’m really a big fan of corner desks, so it should come to no surprise as to WHY I want to review this desk and see if it is worth getting or a complete waste of money. So should you really bother getting the Walker Edison Soreno 3-Piece Corner Desk? Well I’m going to be researching this product and finding out if it’s any good or not. This modern desk offers a sleek design while the frame is crafted from a durable steel. This desk also features a thick glass top for a more contemporary look. The ‘L’ shape that this desk offers also helps it fit in corners so you won’t struggle to find a great place for this desk to sit, and giving it a very attractive final look. You aren’t exactly stuck with one configuration either, this desk is designed so you can choose any side to mount your keyboard under, the tray also lets you slide the keyboard in and out from under the desk. What stood out to me the most was the glass top that this desk features. It is strong and sturdy so it’s not going to break easily either, unlike some glass tops that break just from a mug being placed on it. Not only that, but having the capability of sticking the keyboard tray on any side of the desk was something you don’t see in many desks, I find that to make this product unique from the others. This desk is currently under $100 on Amazon.com, also the #1 Best Seller which seems to show that this desk is definitely something to consider. There is also a 30 day return policy. Return it for a repair OR a full refund if you don’t want this desk anymore. Because of the sleek and contemporary design, this makes a great choice for a modernized home office. A small business usually needs a lot of desktop space as well, I see that this desk offers amazing room for papers and projects, so this could also work for that. Even if you are just wanting a desk for a ‘decoration’, or ‘room filler’ this would work perfectly because it looks great! This desk is definitely not compatible for a child’s bedroom, for the simple fact that it is GLASS. Glass and children just don’t mix at all! It would also be a bad idea if you’re office theme is more old-school, where your sole focus is hardwood furniture. Do I Recommend This Desk? For the price you pay for this desk and the quality that comes with it, I would get one myself in a heartbeat. So yes, I would easily recommend this desk! It doesn’t have drawers or anywhere to install drawers, but I think that with the amount of room space this desk offers, you don’t really need additional storage. If you were really wanting this desk but not sure due to no extra storage, I would suggest you get this desk and purchase some additional storage drawers so you can put them next to it. Then you can get the best of both worlds! However if you want something with drawers or at least capable of having additional storage attached to it, then this desk isn’t for you. I know some people need drawers for their office, and this desk simply doesn’t have any. If you want something more storage-friendly, however you will still need to install them yourself, check out the Altra The Works Desk. Maybe you want a desk where you can easily place your keyboard and mouse on the same tray. This desk is not as big BUT it is much cheaper. Read my Sauder Beginnings Computer Desk review. This desk is literally able to sell itself, for that simple reason I wouldn’t hesitate in purchasing this for myself. Over 88% of the feedback regarding this desk is actually all GOOD. While the rest of the bad feedback is only due to minor problems, such as not having any additional storage. There is also another slight problem worth mentioning. If you have heavy items on this desk, be prepared for the glass to break. Otherwise if you aren’t planning on having everything on it then this is definitely a great desk and worth using. If you want to have your entire computer tower as well as the monitor and printer then please don’t buy this desk. It is simply not designed for that much weight, making the glass smash and damaging everything on top of it. If that’s what you want this desk for, then don’t purchase. I find that the pros and good feedback from this desk heavily outweigh the bad, for that reason and many more I have outlined, this desk is highly recommended!